One of the Raspberry Pi’s many features is that it’s easy to connect to displays: it has both a modern HDMI connector and a phono socket dispensing old-school composite video. However, there are times when one doesn’t want a large monitor around but would rather have a few seven-segment displays instead. 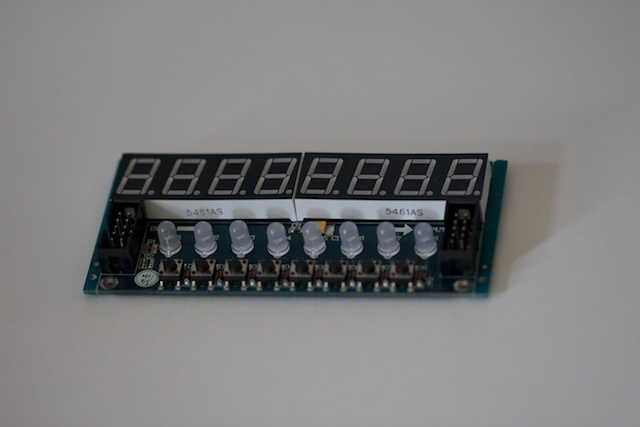 Whilst one could build that from scratch, one can also buy small modules with eight seven-segment displays, eight red-green LEDs and eight push buttons for about $7 (as of August 2012). I bought mine from dealextreme1 but there might be other sources. The boards are basically just the LEDs and switches, plus a TM1638 driver chip. The chip sits on a two-wire serial bus which makes it fairly easy to connect the boards to a computer/microcontroller of your choice. Of course, one needs a little bit of software, so I wrote some. John Boxall wrote a blog about it2 which describes the boards in great detail. The only important difference between the Arduino and the Raspberry Pi in this case is that the Arduino’s a 5V beast but the Pi prefers 3.3V. Happily though the dealextreme board appears to cope perfectly well with the lower supply voltage. My code isn’t really a port of Ricardo’s Arduino library: I wanted a different API. However, I did copy his nice 7-segment font, and his code was very helpful when it came to understanding the data-sheet. You can then grab my TM1638 library from github7 in a couple of ways. tm1638-hello: The canonical ‘Hello World’ program. tm1638-buttons: A simple demonstration which reads the buttons. 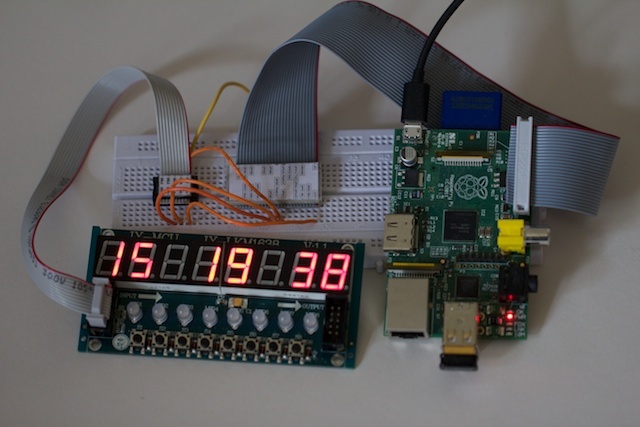 Dominik Eschenmoser pointed out that if you’re using revision 2 of the Pi hardware, you have to chance the clock pin from GPIO21 to GPIO27. Once you’ve sorted out the hardware, doing simple things with the hardware is easy. You need to run the program as root (which is what the sudo does above), so that the code can talk to the GPIO hardware. Revised by Martin Oldfield on 29 Dec 2013, original version 12 Aug 2012.